Expansion cards are devices that extend a computer's capabilities and are inserted into expansion interfaces (or "slots") on the motherboard. They're used either to provide functionality that the motherboard or CPU don't provide, or to provide better functionality (or at least functionality that's better-suited to the user's needs) than the motherboard's built-in components. 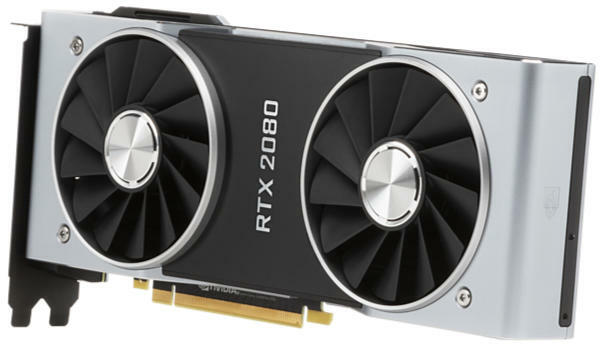 For example, the Nvidia GeForce RTX 2080 video card shown here is, at the time of this writing, a high-end gaming video card. Its performance is light years ahead of any GPU you'd expect to find built into a motherboard or CPU. A user who is a serious gamer might install this card even if they were using a processor or motherboard with integrated graphics. Very early in the history of the PC, practically everything other than the processor had to be installed into the motherboard as an expansion card. The motherboard was basically a board into which "daughter boards" were installed to provide services like graphics, sound, network connectivity, and so forth. Little by little, however, motherboard manufacturers started building "integrated peripherals" into their boards. More recently, processor manufacturers started integrating graphics processors right into the processors themselves. Consequently, it is now entirely possible to build a computer that needs no expansion cards whatsoever. Everything will be built into either the motherboard or the processor. If you're an average user running standard desktop applications, chances are the built-in peripherals will work just fine for you. If so, you can save quite a bit of money by not having to buy a video card, sound card, network card, and so forth. But if you need better functionality than the built-in components provide, if they fail, or if they become obsolete, then you'll need to install one or more expansion cards to take over those functions. Video cards generate and provide a computer's visual output to a monitor or other video device. Many video cards also allow input from a video camera, VCR, DVD player, or other video sources. Others include built-in TV tuners and DVR's. Sound cards provide a computer's audio output to speakers or other audio devices. Most audio cards also allow sound input to the computer from a microphone or other audio sources. Studio sound cards are specialized for musicians and producers, and together with specialized audio recording software, provide most of the functionality of a professional recording studio. Network cards provide connectivity to an Ethernet network. Modems provide connectivity to a network via a dial-up telephone line. Most motherboards have built-in network adapters, and there's usually no reason to replace them with a network card unless the built-in adapters fail or become obsolete (for example, if it doesn't support gigabit). Few modern motherboards have built-in modems, however; so if you need dial-up connectivity, you'll have to either install an internal modem or connect using an external modem. Controller cards provide the ability to connect and manage drives in excess of the number the motherboard can manage, of types that the motherboard can't manage, or in configurations that the motherboard can't manage (for example, adding a RAID controller to a motherboard that doesn't have built-in RAID capabilities). In practice, controller cards are usually used to retrofit existing computers to enable the use of newer drive technologies. For example, when SATA drives were introduced, SATA controllers were big sellers because few motherboards natively supported SATA. The same thing happened when USB 3.0 came out. It was so much faster than USB 2.x that many people installed add-on USB 3 controller cards to enable their computers to use it. Another example would be Firewire cards, which are required to transfer data from some camcorders, but aren't natively supported by many motherboards. Expansion cards, fittingly enough, fit into expansion slots on the motherboard. It's important to purchase cards that correspond to the kind of slots your motherboard has available. You can learn to identify the different kinds of expansion slots by reading this page.